I have bought this product directly from Korea in the past and I was so pleased to see a UK seller selling the same genuine product!! At such a good price too! You do get a lot of product and the thing is you don't even need a lot to moisturise your face! About a peanut sized amount is good enough. Definitely recommend, thanks so much!!! The gel is incredibly soothing and has made my skin feel amazing! It’s not as moisturising as you think it’s more nourishing. It’s possibly you could use a moisturiser on top because it dries so fast. I love it! I absolutely love this product! It's perfect for my dry skin. I use it twice daily, as makeup primer and night cream. I will be repurchasing for sure. Good product, recommend 100% ! 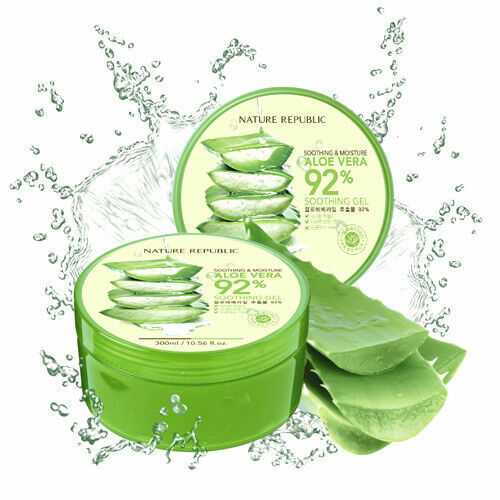 Nature Reublic Aloe Vera Soothing Gel gives my skin smooth and acne free.